After an entire summer of vitaminwater and FADER #uncapped shows on Monday nights in New York, we headed up to Toronto for a special Thursday evening party. Canadian duo Chromeo was all set to entertain a crowd of vitaminwater-drinking fellow countrymen and women in a studio at the CBC building downtown, a venue that was a nice little nod to this week's Toronto International Film Festival. But, as OVO homie and Drake producer Boi-1da got the crowd warmed up, bad weather kept P-Thugg and Dave 1 stuck in the airport. "Weather worked against us tonight," they tweeted, "but plane is taking off soon and we're en route to #uncapped." Pottymouth had been all set to open the show, and they did, killing a set of their signature riot grrrl-inspired punk. And in a beautiful twist of fate, lead singer of Dragonette Martina Sorbara, who had been planning to hit up the #uncapped show anyway, decided she could help out when she heard about Chromeo's plane trouble. She called up her bandmates, two of which were at dinner with their wives, to come play. They pulled together, handling the set like pros for a thankful crowd. Right after, a screen dropped down and a video that Chromeo recorded at the airport played, promising they were doing everything they could to join in the fun. Indeed, the Chromeo guys bought tickets for multiple flights in case any of them took off, but that wasn't working, but they found a way to hop on a private plane out of New Jersey. An impromptu afterparty was planned for their arrival, free to anyone with an #uncapped wristband. As people filed into Wrongbar for the night's second act, Boi-1da DJed brand new Drake track "Wu-Tang Forever." 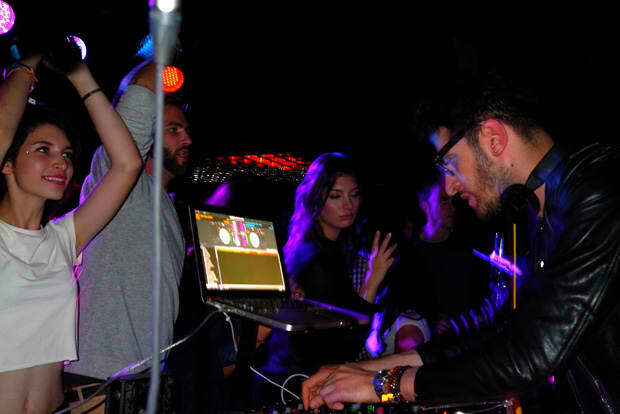 Chromeo landed at 12:30AM and DJed the after party until 3AM. People went nuts—when you're that dedicated to making fun this brilliant, the brilliance is electric. See photos of the party below, and for interviews and performances from all of this (and past) year's #uncapped events, check out the vitaminwater YouTube channel. #uncapped is making Monday nights less boring with surprise performances in traditionally mundane venues. For chances to win tickets and up-to-the-minute location reveals, follow vitaminwater and FADER on Twitter.